This skillet handle is a bit narrower than my big cast iron 14 inch pan so I had to work a decrease on each side of the cover on one round before the end. That tightened it up and then I used the tail at the end to weave it closed even a bit tighter so it fits snug on the handle. If you haven’t already discovered the joy of cooking on cast iron, I hope you will try it. It is so important to clean and season cast iron properly after each use. Without good seasoning of the pan, you will find cooking miserable with everything sticking in the pan. 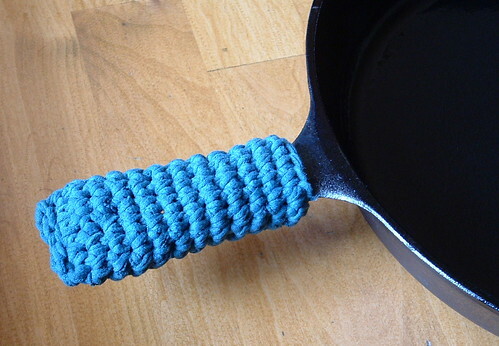 Here is a good informational article on how to clean and season cast iron cookware. With proper seasoning, you will love cooking on cast iron and find it’s almost like using a non-stick pan. Is it safe to leave the crocheted cover on if you put the pan in the oven? How hot it can safely get? @Julie — I don’t use my skillets in the oven. You would want to remove the handle cover if you are using it in the hot oven. I do think it would be fine to leave it on if you are just keeping something warm like at 200 degrees or less. Thanks for asking about that as I hadn’t thought about people using the skillet in the oven. I love these! As well as the knob covers. Brilliant idea.